My home is a ‘no plastic zone’ which includes never purchasing bottled water. I take a reusable water bottle wherever I go for myself and my daughter (she actually has three!) and feel proud to be contributing in some small way to reducing the millions of tons of plastic bottles that end up in the world’s landfills every year. My daughter is also getting a lesson in reducing, reusing and recycling every day and she’s a stickler for saving water – no running taps around here. The next step in our global effort to eradicate single-use plastic water bottles is here with the release of Reduce reusable water bottles for adults and children. These are no ordinary water bottles – they are designed to replicate what many people have done for a decade now – stacking rows and rows of pre-bottled water in their fridge and grabbing a new one every day. 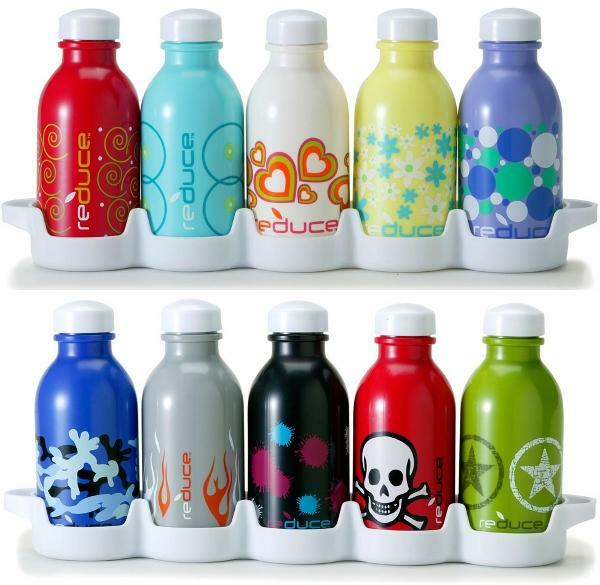 The BPA-free durable plastic Reduce bottles come with a fridge storage tray, making it easy to stop some bad habits. Simply fill all five up at the start of the week and you’re ready to go. Why not get the whole family started with a set for each person? Both children and adult sets are available to purchase from Urban Baby for $19.50 and $24.95 respectively. A fantastic way to protect our planet and save some money too!